UNITED NATIONS, December 30 -- Better late than never? 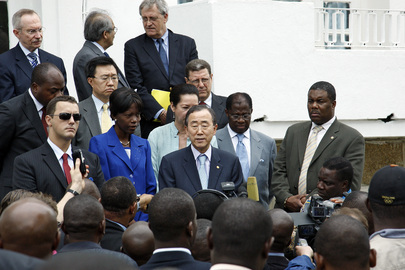 For weeks Inner City Press has been asking the Office of the Spokesperson for UN Secretary General Ban Ki-moon about abuses and irregularities in the Congolese elections. At first they said they'd have no comment until after the results were announced; then they said a probe might be in order, "for the future." On December 30, the UN belated answered Inner City Press' question about the looting of the headquarters of opposition figure Etienne Tshisekedi by saying "MONUSCO is investigating the alleged involvement of members of the national security forces in this looting incident." On UDPS meeting with MONUSCO: On 29 December, MONUSCO senior officials met a delegation of opposition political parties, led by Mr. Vital Kamerhe of the UNC political party who was accompanied by the Secretary-General of the UDPS and Director of UPDS leader Mr. Etienne Tshisekedi’s Cabinet, Jacquemain Shabani. The meeting was held at their request. The following issues were raised: the restrictions on Mr. Tshisekedi’s freedom of movement and communication, the resumption by the Independent National Electoral Commission (INEC) of the legislative elections results compilation process and human rights violations committed against opposition supporters. MONUSCO informed that it was conducting investigations into a number of reported human rights violations by national security force personnel and agreed to follow up, as appropriate, and in accordance with its mandate, with relevant Congolese authorities on a number of issues raised. On DRC journalists: Since the beginning of the electoral campaign on 28 October, MONUSCO has documented 22 cases during which journalists have allegedly been intimidated, threatened or attacked in relation with their work. These alleged incidents took place mostly in the Kasai Oriental and Maniema provinces as well as in Kinshasa. The alleged perpetrators are members of the national security forces and provincial authorities. MONUSCO is following up with relevant Congolese authorities on a number of these reports. Does Ban Ki-moon have any comment on the killing, presumably by Syria government forces, of citizen journalist Basil al-Sayed, who died in the hospital Thursday of wounds sustained after filming at a checkpoint in the district of Bab Amr in Homs? What is Ban Ki-moon's response to the requests that he finally speak up and call for Egypt to release jailed blogger Michael Nabil, 26, sentenced by a military court to three years in prison in April for insulting the armed forces and who has been staging a hunger strike since August, now in "dire" condition? On Egyptian blogger: We are checking for more specifics on this case. More generally, the Secretary-General has been clear in calling for human rights, including the right to expression, to be upheld in Egypt's transition. But the Syrian killing of Basil al-Sayed is well documented. Watch this site.